Efficiency of 85% is achieved, using a simple tube structure (coil system). Either of two types can be selected, according to the working temperature. The top of the drum is equipped with a water-cleaning hole for easier cleaning. 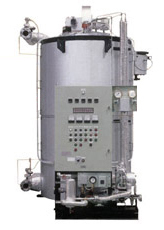 Compared with a steam boiler, cycle loss is low, so energy and cost can be saved.